The 2018 Acura TLX will make its debut at the upcoming New York International Auto Show (NYIAS) in April, where it will “boast a more aggressive, sporty and alluring look inspired by the Acura Precision Concept,” according to the carmaker. 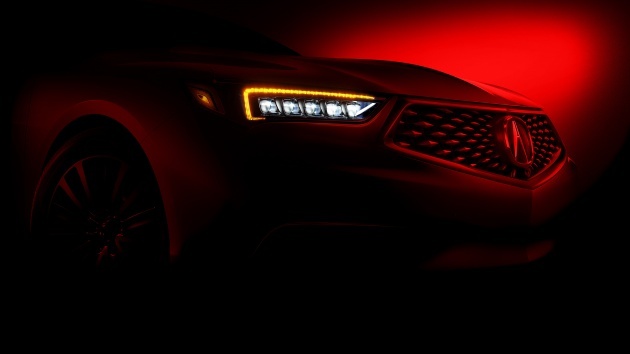 The teaser image provided gives us a glimpse of the TLX’s new front end, where the Precision Concept-derived grille can be clearly seen below the bulging bonnet. The Jewel Eye LED headlights also follow a different design, with the indicator portion forming a half perimeter above the five individual lighting elements. While the rest of the car will only be revealed in New York, our spy photographers managed to snap a few photos of the TLX during a promotional shoot. Acura will offer various trim levels of the TLX, each sporting a different front bumper design to differentiate themselves. As for the rear, the TLX appears to gain new graphics for the taillights as well as dual exhaust pipes that differ in shape depending on variant. The current TLX is available with two engines, the first being a 2.4 litre four-cylinder with 206 hp and 247 Nm of torque, while the other is a 3.5 litre V6 with 290 hp and 362 Nm. The former is paired with an eight-speed dual-clutch transmission and the latter, a nine-speed automatic. Models with the V6 engine can be had Acura’s Super Handling All-Wheel Drive (SH-AWD) system and Precision All-Wheel Steer (P-AWS) can be fitted to both engine types. We’ll have to wait for the NYIAS to see if these engines will be carried over, or if any changes will be made. Not a huge fan of this new design. But it does look more modern compared to the beak design.